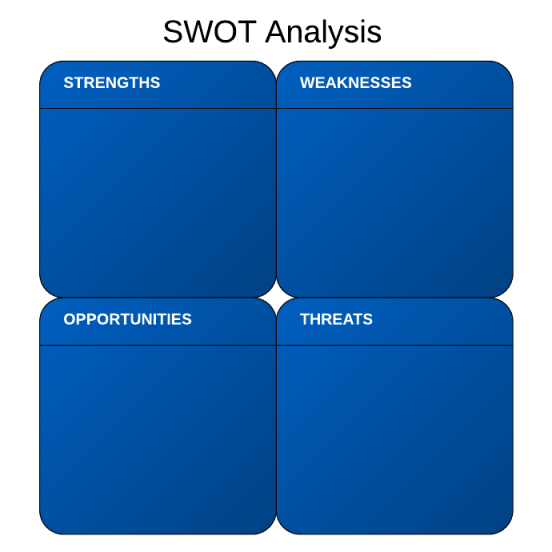 Should You Be Using SWOT Analysis Software? Does SWOT stand for Stupid Waste of Time? It's a question many a business student, knee-deep in market research and PowerPoint slides, has posed. Although SWOT analysis is a time-honored tool, it often feels like regressive busy work. So how can you best utilize the SWOT? First, the good: A SWOT diagram is deceptively simple. The name stands for Strengths, Weaknesses, Opportunities, and Threats, and the analysis itself is fairly self-explanatory: simply dedicate one quadrant to each value. The beauty of the SWOT diagram is its ability to analyze both interior and exterior perspectives. This diagram's simplicity might be the reason it's so popular with educators, businesses, and non-profits around the world. But the SWOT is far from perfect. It's often misused, poorly understood, or just plain abused. Author Robert M. Grant is a leading strategy expert and stalwart opponent of SWOT diagrams. Among other critiques, he notes that "typical SWOT guidelines promote superficial scanning and impromptu categorizing in lieu of methodical inquiry." Prioritize your list. A glaring problem with SWOT diagrams is that each bullet point is weighted equally. A simple remedy is to rank or rate each point in terms of its importance. That way, the quick glance that most execs give to a SWOT diagram imparts a more accurate view. Bring in other stakeholders. Like any document, a SWOT analysis that's generated by a group of similar people -- managers, advertising execs, interns -- will be colored by their experience. But what you don't know can hurt you. Solve this problem by soliciting candid feedback from others in your organization even before you start diagramming. Expand your strategic thinking. A lot of folks will present a SWOT, dust off their hands, and think the work is done. I hate to be the bearer of bad news, but a SWOT analysis should be the beginning, not the end, of your strategic planning. Think of a SWOT as a border piece to your strategy puzzle -- it's a small part of the bigger picture, but it serves as a great starting point. Think ahead. Remember that any one survey, whitepaper, market report, and yes, SWOT analysis, is just a snapshot of what's happened in the past. A SWOT diagram is an excellent tool for capturing the past and present state of affairs, but your team needs to expand its thinking to future strengths, weaknesses, opportunities, and threats. Rely solely on a SWOT diagram. A SWOT isn't the be-all, end-all of strategic planning. Try also working with a focus group, engaging in scenario planning, making a STEER analysis, or using another technique entirely. The point is to be informed through a variety of sources. Confuse strengths and accomplishments. Dr. Grant cautions that calling accomplishments "strengths" (or vice versa) is a recipe for disaster. Equating something like market-share leadership with competitive advantage or strength can be inaccurate, since the implied causal relationship may no longer exist -- or may never have existed. Dr. Grant writes, "When market-share leadership, early entry, or other accomplishments do seem to underlie current advantages, then the specific advantages should be enumerated (e.g., cost leadership) and their sources noted (e.g., superior scale economies and bargaining power derived from market share). Be redundant. You don't need to cover the same points over and over again. Often, a business plan or other report offers a textual retread of information covered in the SWOT analysis. Save yourself some time and skip the SWOT altogether, or keep it to a simplified summary. Lucidchart's SWOT analysis software is free and easy. Whether you want to build a complex digital diagram with images and outside links, or a quick and dirty quadrant for a class, Lucidchart has the functionality you need to create an impressive, informative diagram. You can also use Lucidchart's SWOT analysis template for word.